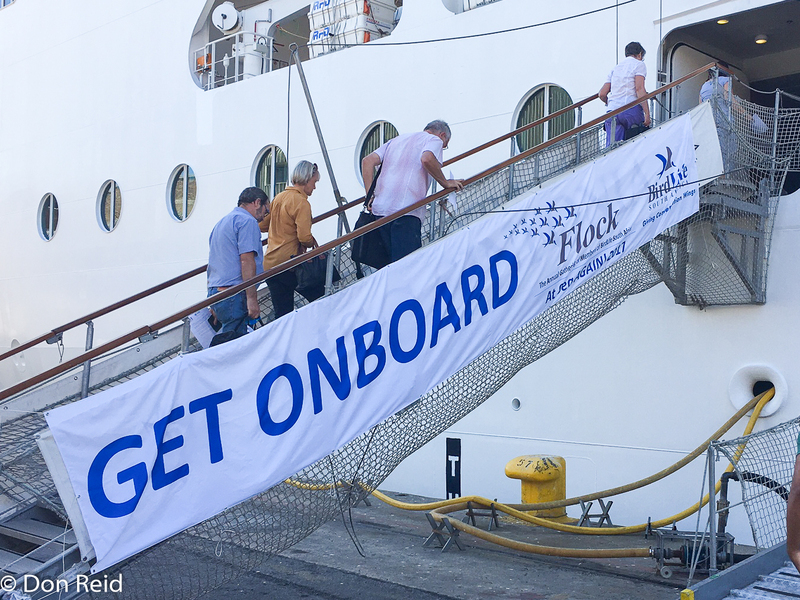 Ever since booking our places on the “Flock at Sea 2017” cruise some 9 months prior, Gerda and I had been looking forward to the experience of a 4 night cruise aboard the MSC Sinfonia, along with almost 2,000 other birders – a “cruise to nowhere” out of Cape Town with the main aim of seeing as many sea birds as possible in three and a bit days, cruising in the waters off the southern coast of South Africa. 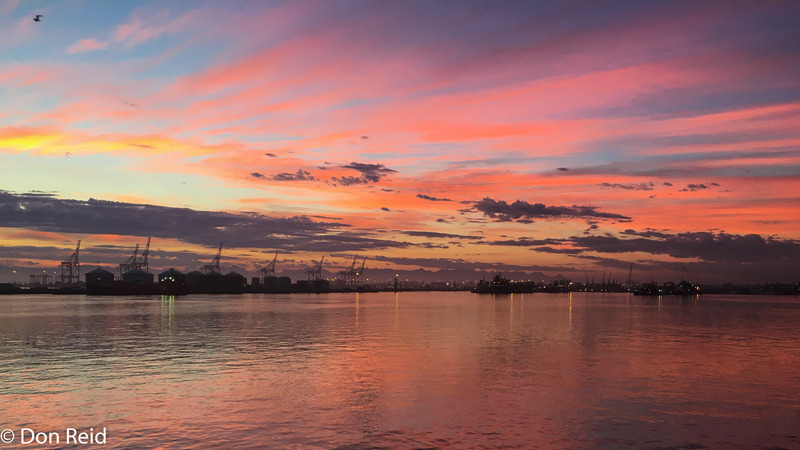 A facebook page created for the event and regular Birdlife SA emails provided essential information, building to a crescendo in the final weeks and days leading to embarkation day – 24 April 2017. 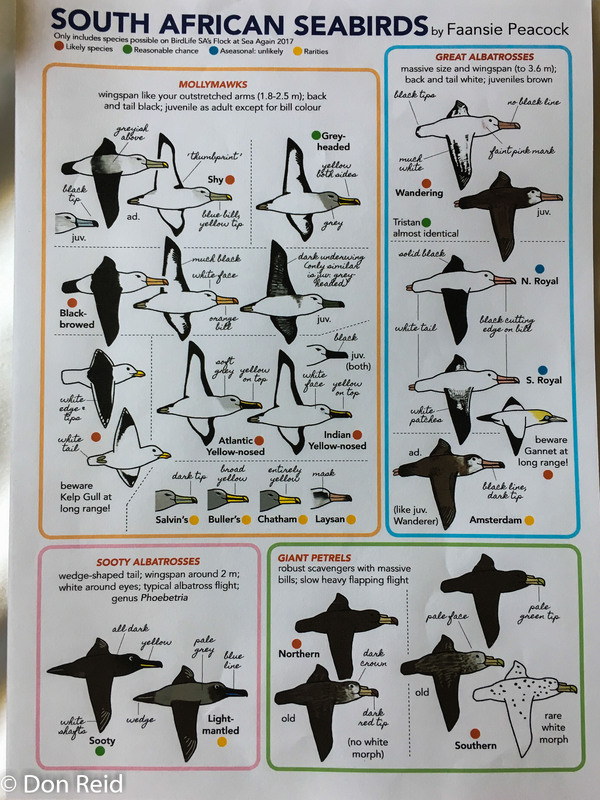 There was also no shortage of seabird ID advice including a set of ID sheets depicting the birds most likely to be seen which I printed and put in my trip file. Faansie Peacock was also good enough to produce and share a wonderful, concise set of “cartoon-like” sketches of the probable species, with notes on the features to look for, which I printed and carried with me folded in a pocket for reference – these proved to be super-useful for a quick check when a number of species were spotted in quick succession. 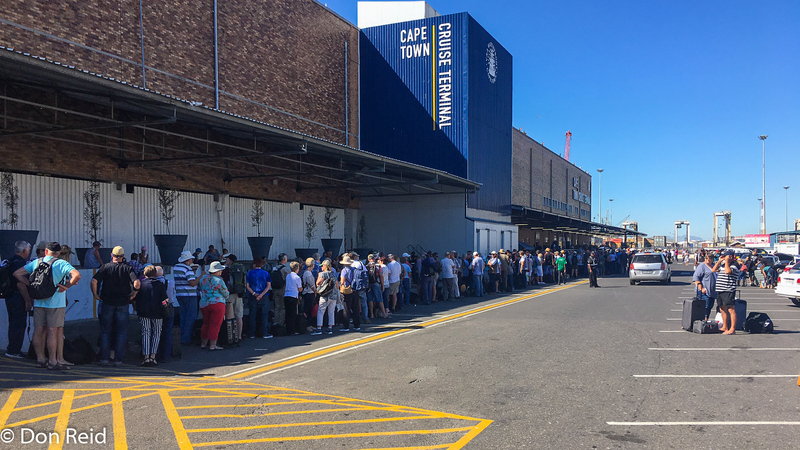 This was not entirely a new experience for me, having had the privilege of doing two pelagic trips out of Simonstown ( near Cape Town) in the past, however the mode of transport was very different this time – a large cruise liner with close to a couple of thousand other passengers and 700 or so crew, versus a small ex-patrol vessel with about 15 people on board and one or two crew. We had travelled from Mossel Bay the day before embarkation, staying overnight in the Commodore hotel at the Waterfront, so it was a short drive to Berth E at Duncan Dock, where I dropped Gerda off with our baggage, parked in the nearby parkade and returned to the quay to join the already long queue….. for the next couple of hours while the previous load of passengers disembarked very slowly due to IT problems at Immigration (or so we understood). 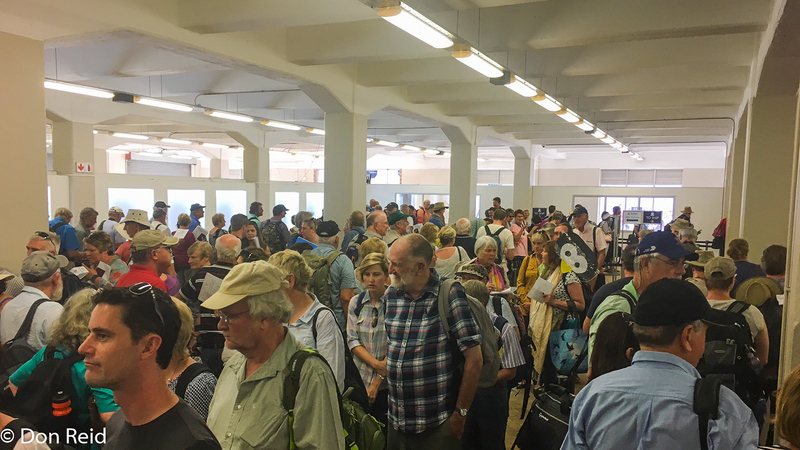 This was not necessarily a bad thing – it gave us time to get acquainted with others in the queue, meet up with some old friends and take in the buzz of 1,945 keen birders all looking forward to the next few days. 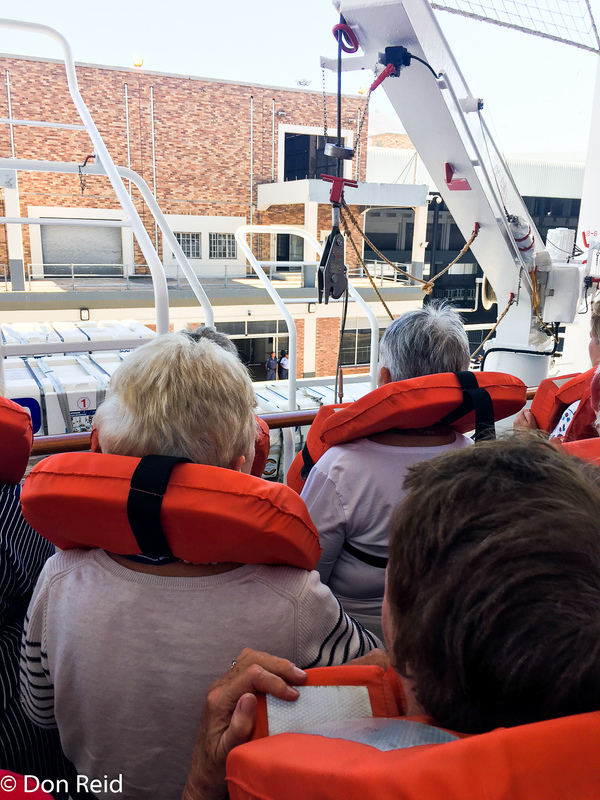 Once boarding commenced, it all went quite rapidly and a couple of further queues later we had taken care of all the formalities and could enjoy a late lunch in the buffet restaurant and settle into our cosy cabin. 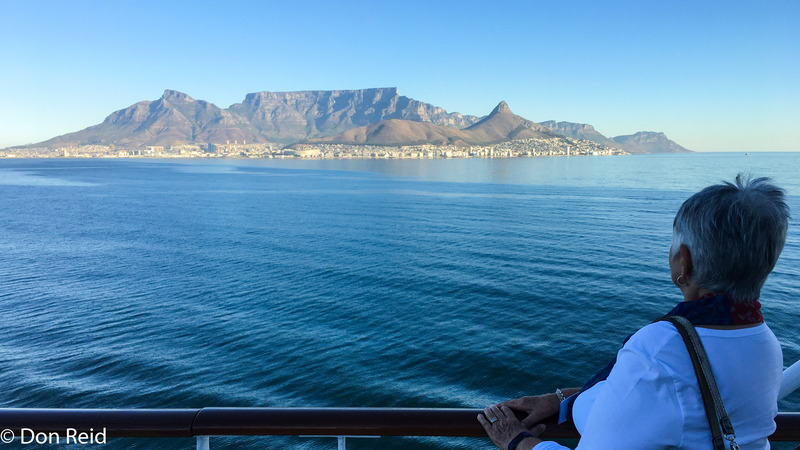 The emergency drill followed and by 4.30 pm we were departing from Cape Town harbour and heading out into Table Bay in perfect weather, the ship leaving a trail of churned sea and the classic view of Table Mountain receding slowly as we stood on the rear deck, enjoying the moment. 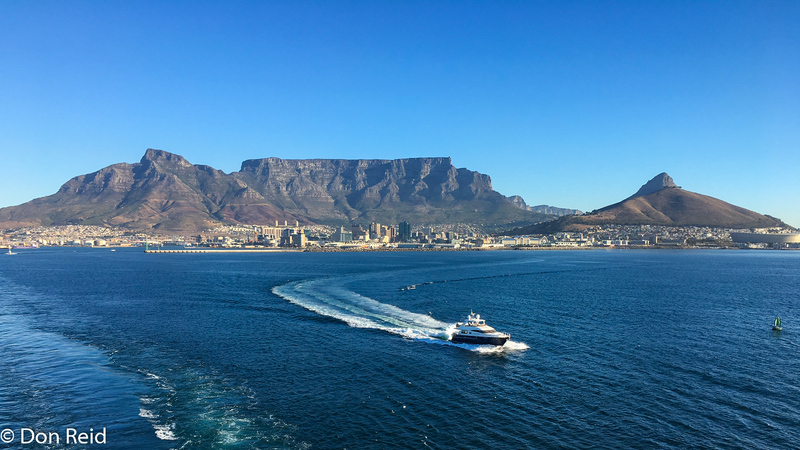 I couldn’t help thinking of Sir Francis Drake’s comment – he called it “a most stately thing and the fairest cape we saw in the whole circumference of the earth” – and who can argue with that! 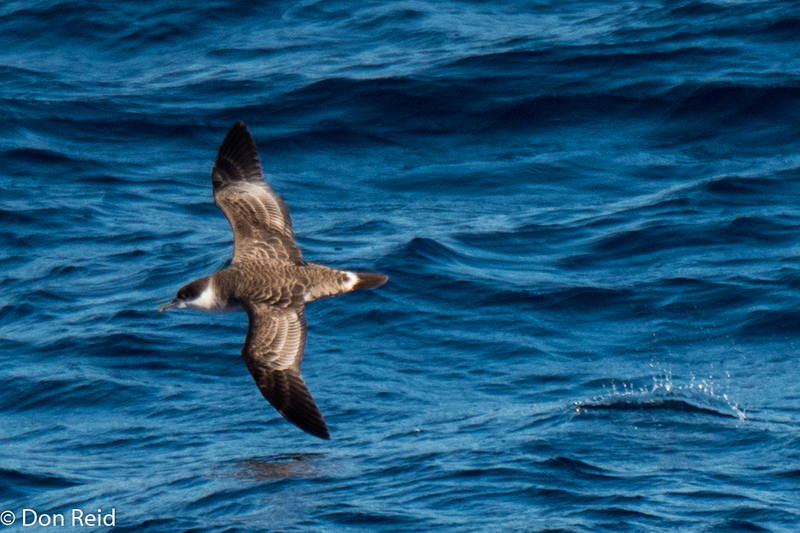 First birds encountered were those favouring the shallower waters close to land – White-chinned Petrel, a skein of Cape Cormorants flying by in their typical V – formation, Cape Gannets and the first Albatross – a Black-browed sitting on the sea. Later, dinner was in the Galeone Restaurant at the table to which we had been allocated, along with our dinner-table companions for the cruise, Herman & Magda Sauer and Ben & Carolien Prinsloo. 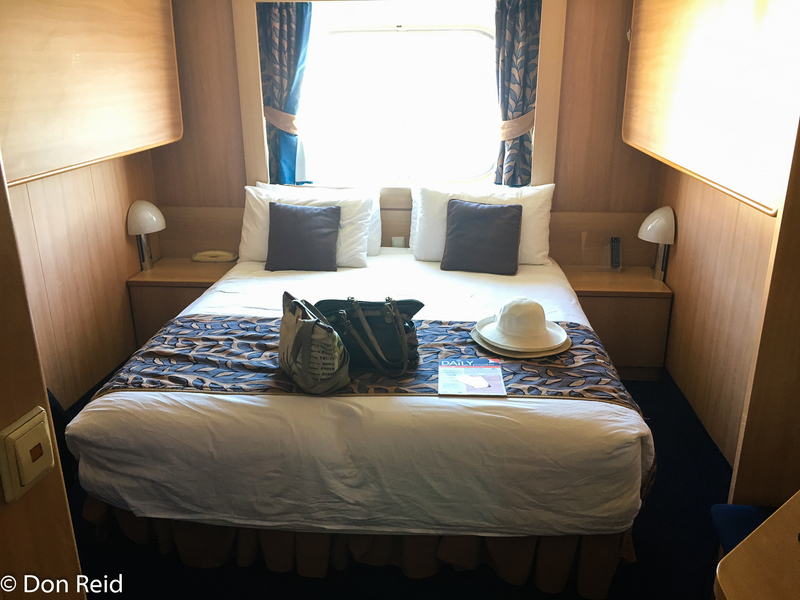 The next 3 days were busy, with our time divided between meals – breakfast in the room, buffet lunch and sit-down dinner, birding from the decks, attending talks and spending time just relaxing with Gerda. The birders who were up early enough on the first morning were treated to sensational birding, the highlight being a Light-mantled Albatross, classed as a mega-rarity in Southern Africa. 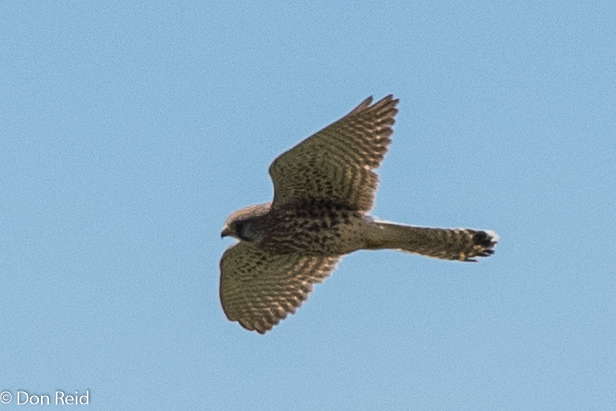 Unfortunately I missed out on this opportunity and had to be content with the 3 lifers I saw later on during the day – certainly a thrill but dampened somewhat by hearing what I had missed during the first few hours. The rear decks seemed to be the place to be, crowded with keen birders on every available level, to the extent that I had to wait patiently for some to disperse before finding a place at the rail. At other times I spent time on the bow decks and on the side decks which provided a different perspective. All hands / birders on deck! 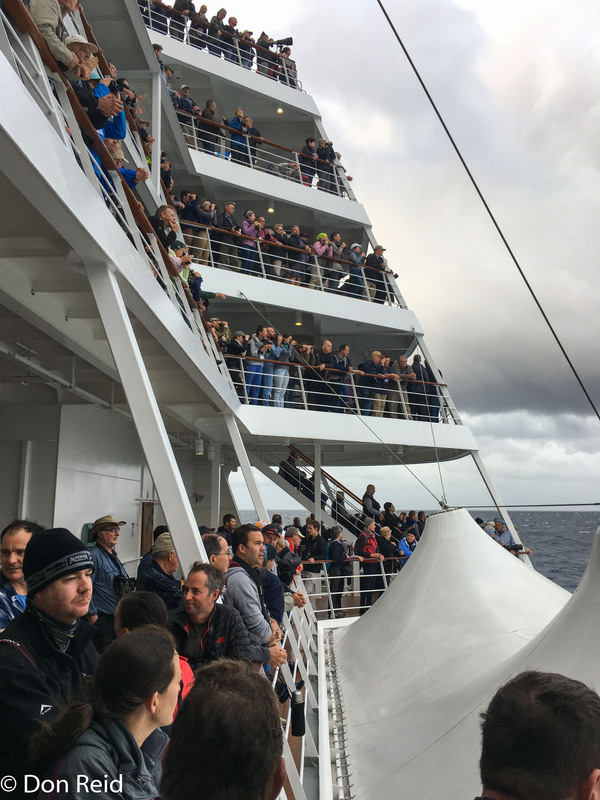 Regular sightings of birds flying into the calmer wake of the ship were announced by the experts and were met by a hum of excitement by the layers of birders, followed by clicking of the many cameras. 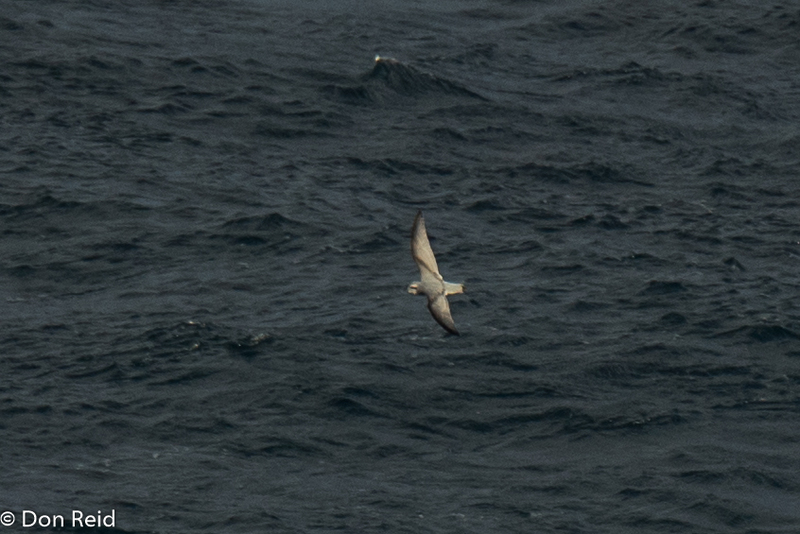 Albatrosses were plentiful, including Wandering, Southern Royal and Indian Yellow-nosed Albatross, with Sooty and Great Shearwaters and a White-headed Petrel (my first lifer for the trip) in the mix. 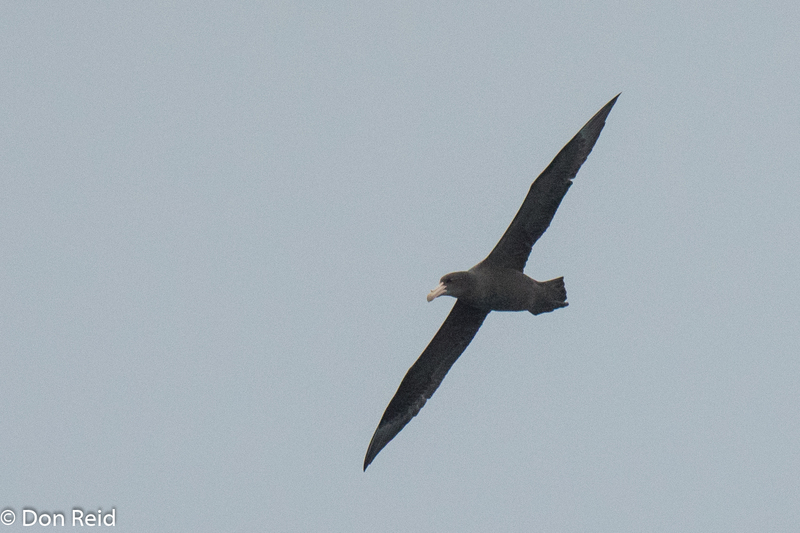 On our way back to the cabin a Sooty Albatross flew by for my second lifer of the morning, albeit a view diffused by the glass sides at that spot. 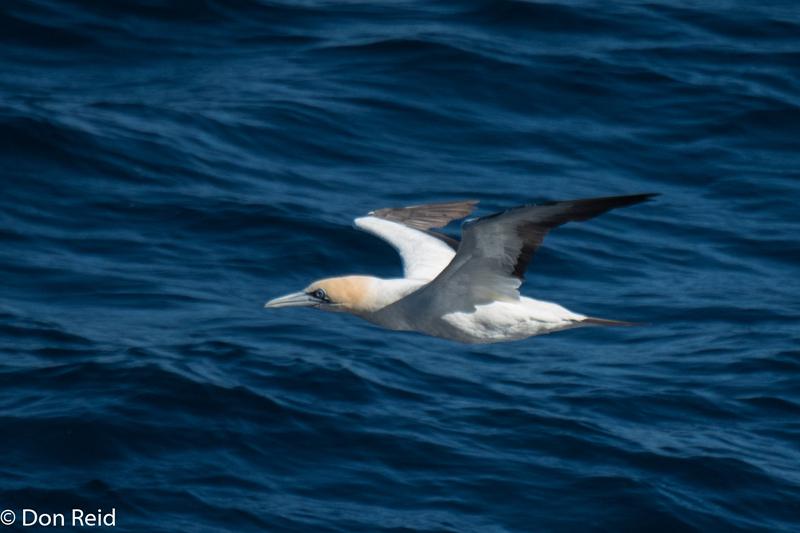 Returning in the afternoon to the still crowded stern decks, I added a further lifer when an Antarctic Prion glided past the wake and an imposing Northern Giant Petrel swept by in grand fashion. I made sure I was in position early morning, which was a lot quieter birding-wise, nevertheless Shy Albatross and Soft-plumaged Petrel showed well. 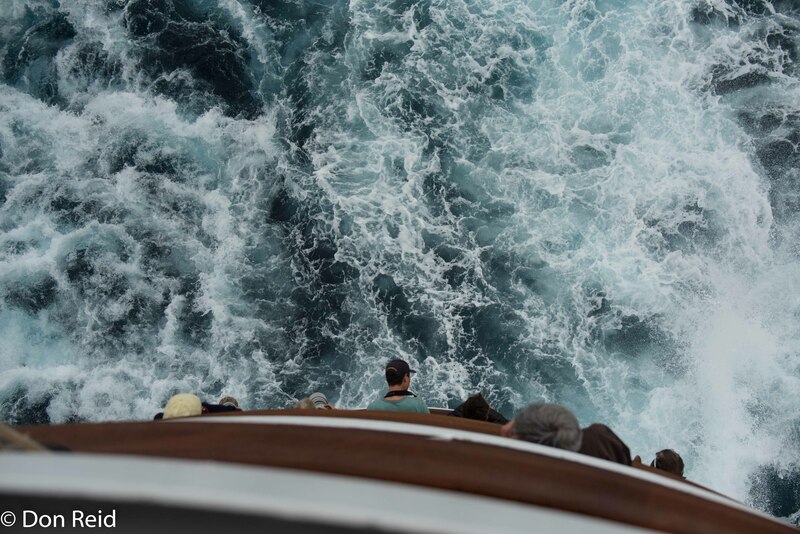 After a quick breakfast in the cabin I was back on the stern decks where chumming was being done using large frozen blocks of chum, to little effect it seemed, other than another White-headed Petrel which performed beautifully in the wake along with a Northern Giant Petrel. 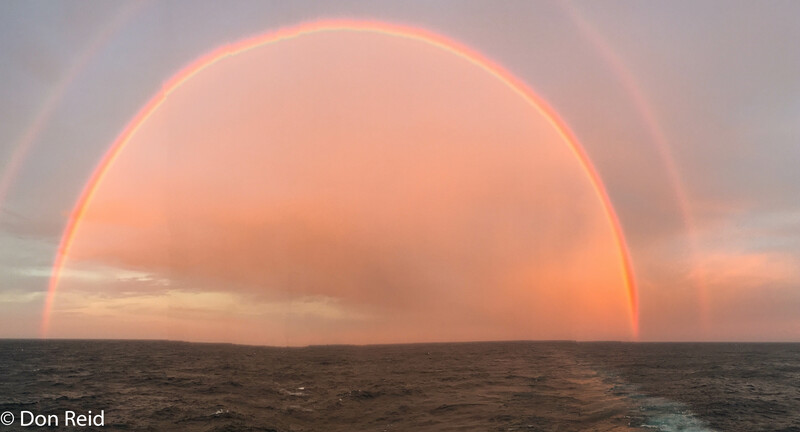 Late afternoon saw me in position once again on the rear deck for some further birding, when a double rainbow developed and soon stretched across the horizon in a display that was nothing short of amazing – it also reminded me of those half-moon shaped “orange slice” sweets we used to have as a treat when we were kids. 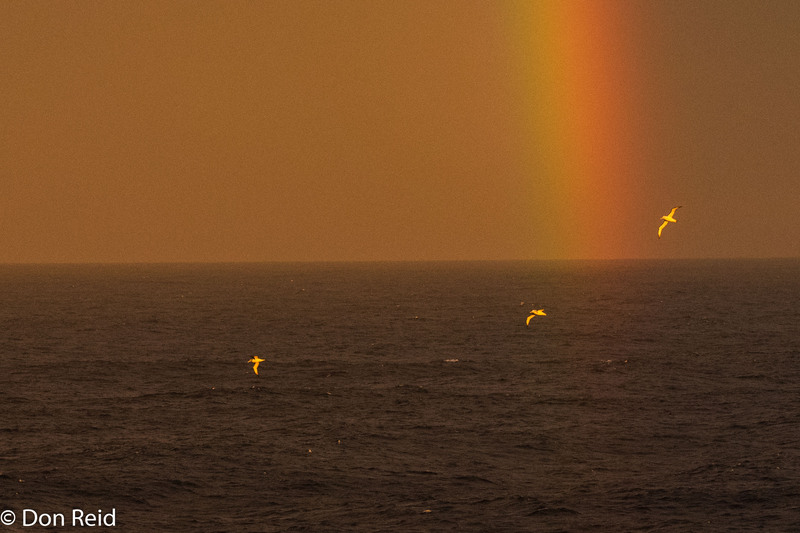 As a bonus, at that moment a clutch of Albatrosses glided gracefully across the face of the rainbow, turning it into a quite magical scene, impossible to reproduce in an ordinary photo. 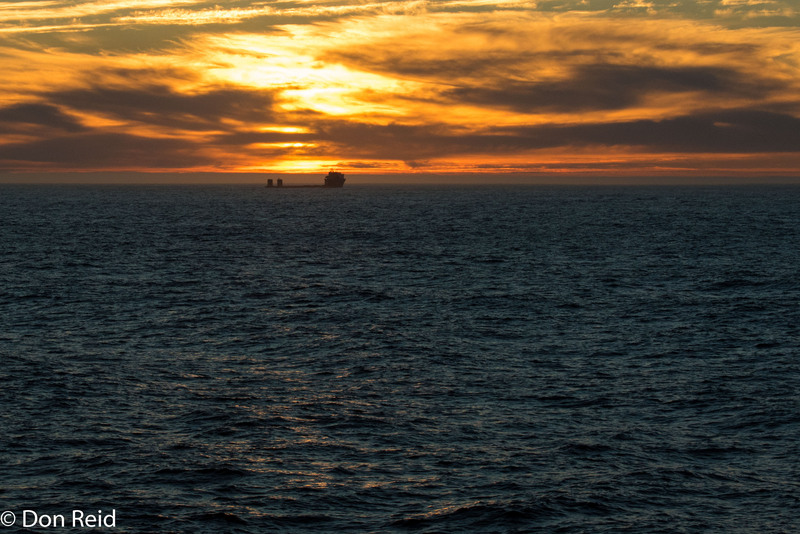 As if this was not enough, it was followed by a sunset to dream about as the ship slowly continued on its way into the night. 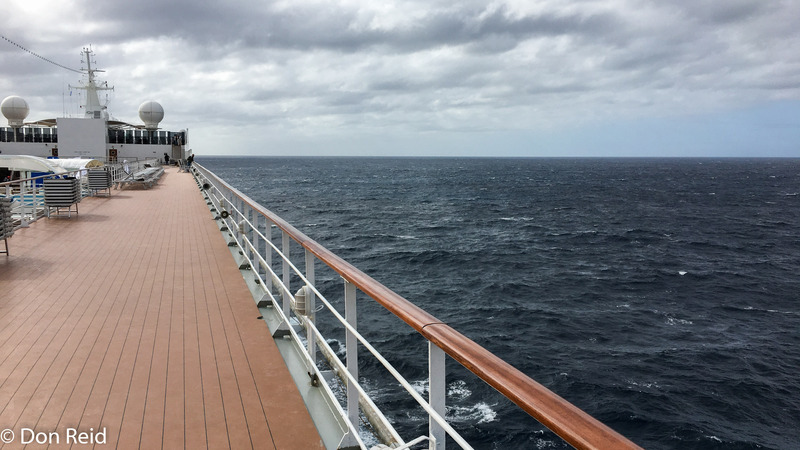 The wind had come up strongly, which made for interesting, slightly drunken walks down those long passages, a challenging shower experience and a night of being bounced gently in our bed as the Sinfonia battled against 80 km/h winds and high swells – thank goodness for stabilizers! Down the long passage and onto the stern deck, where several birds were hanging around the wake – Shy and Indian Yellow-nosed Albatrosses, Great-winged Petrel, Great Shearwater and White-chinned Petrel were all prominent, plus a couple of new species appeared when Cape Gannets were seen nearby and a lone Subantarctic Skua flew in close to the ship. 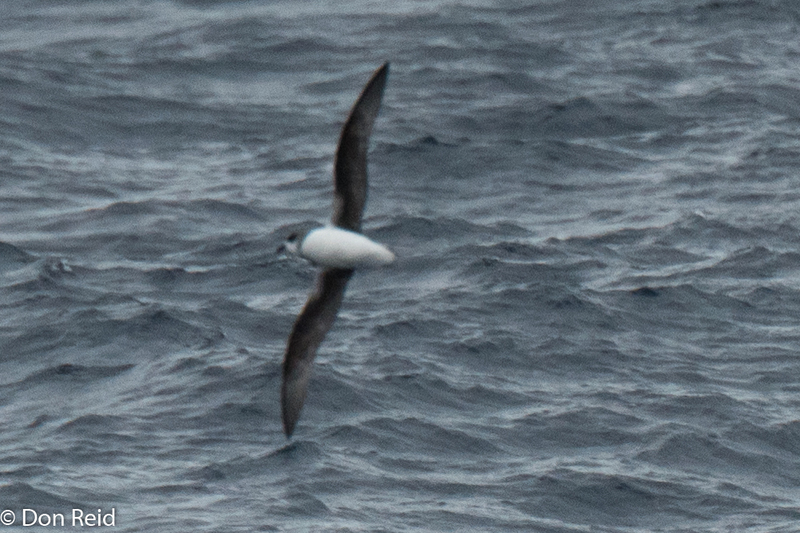 After breakfast I added Atlantic Yellow-nosed Albatross to my list before heading to the theatre for a highlight of the trip – the talk on Albatrosses by Peter Harrison. 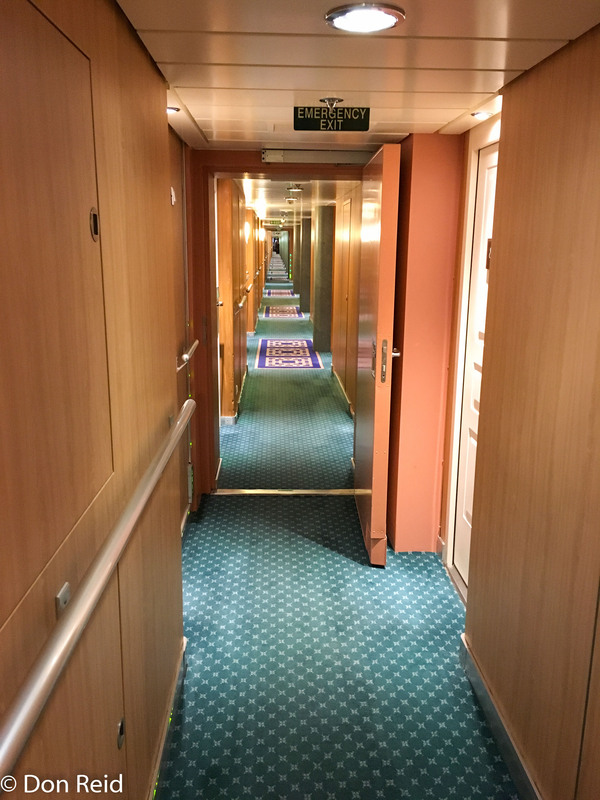 This was followed by lunch where after we headed to our cabin for a bit of a break from all the activity……….. not for long, as I glanced through the cabin window and noticed an Albatross passing by, then another…. and another. 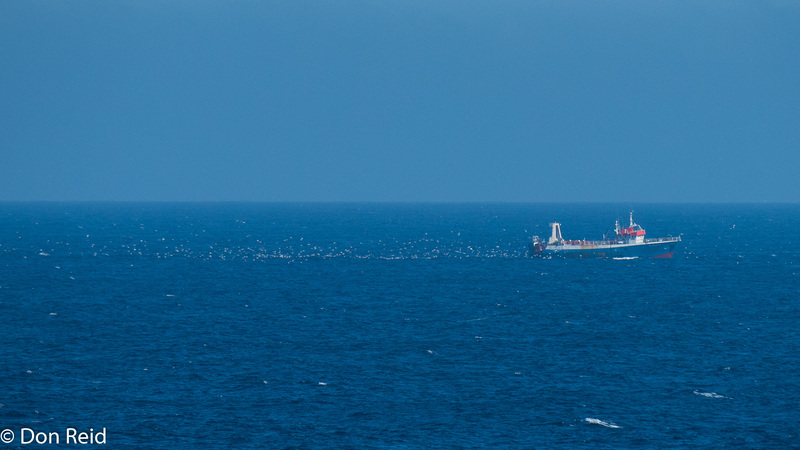 So I grabbed my gear and headed to deck seven starboard to find a continuous stream of seabirds passing by – my guess was that they were heading towards the trawler we had seen earlier, “towing” in its wake a flock of many hundreds of birds. The stream continued steadily for more than an hour during which time a few hundred Albatrosses, Gannets, Petrels, Shearwaters and Storm Petrels passed from bow to stern, many doing an airborne pirouette and a pas de deux before going on their way – apart from the thrill of the lifers on Day One, this was for me the absolute birding highlight of the trip. 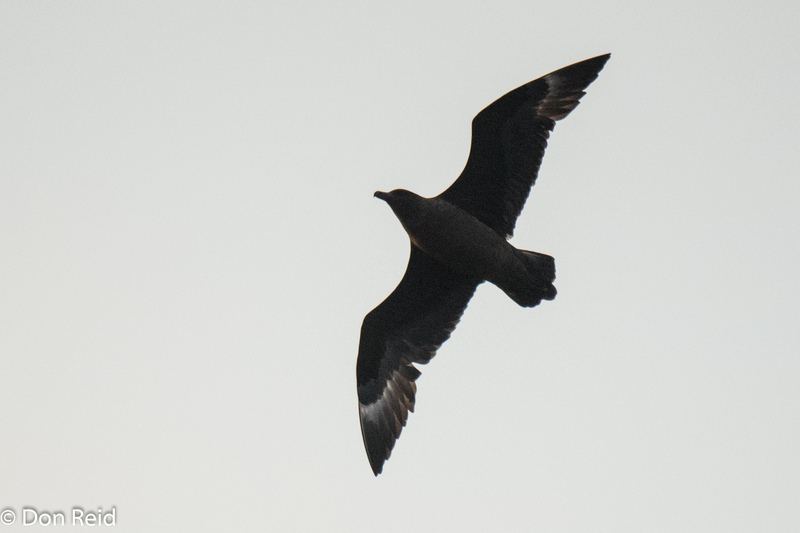 Just a pity all the Birdlife guides were attending the AGM, so there was no one to confirm the ID of some of the trickier birds that passed by, including some Storm Petrels in the distance. All this excitement needed a short nap to recover, by which time the wind had died, the sea had gone quiet with hardly a swell and the birds had all but disappeared. 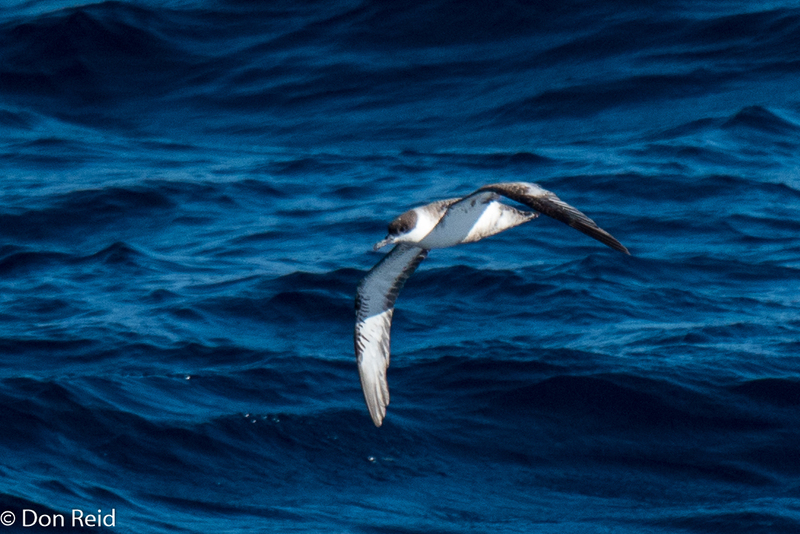 However that was not quite the last of the birding – after dinner at 10.30 pm I went to deck 6 starboard where it was said Great Shearwaters were feeding and sure enough there they were, up to seven visible at a time, feeding near the ship’s side, drawn to it by the lights. So what birds did I see? Some really good ones actually………. Dale Morris on Bird Photography – he showed us an impressive set of his images along with tips on getting that different shot, more art-like compared to the usual “bird on a stick”, as he put it. 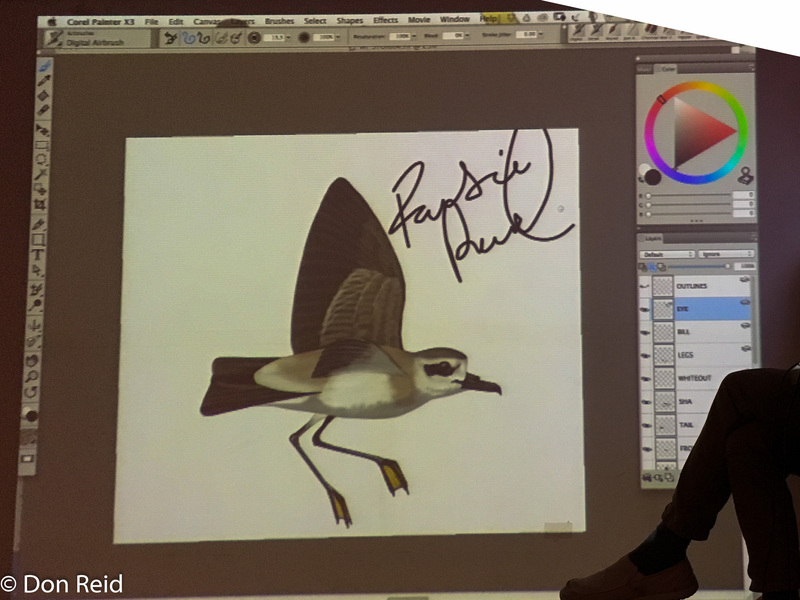 The end result of a 40 minute digital painting session – and he made it look easy! Peter Harrison on Albatrosses – Ocean Nomads – the person introducing him used phrases such as “inspiring”, “best speaker he had ever heard”, “brings tears to your eyes” which I was wont to dismiss as hyperbole, but once his mesmerizing talk was done, I realised he was spot on. Certainly one of the best speakers I have heard and yes, I had a tear welling at times during his talk, which had me literally spellbound and on the edge of my seat for the full hour. 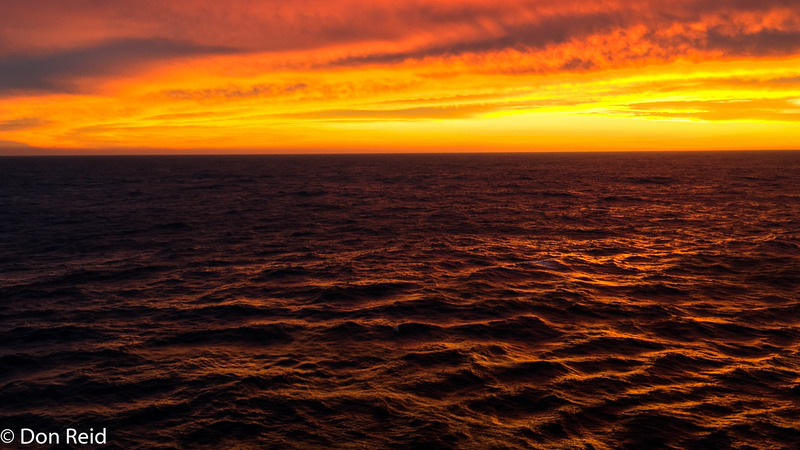 Albatrosses have always held a certain magic for me, which Peter Harrison took to a new level – I will never view Albatrosses quite the same again. 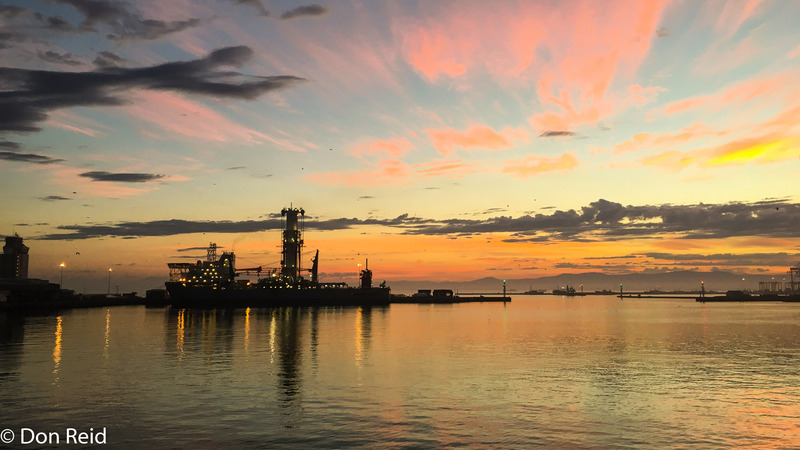 We docked before sunrise in Cape Town harbour, only to be met by the most beautiful scenes of the harbour bathed in the early morning hues, turning ordinary dockyard scenes into those worthy of hanging on your walls. A fitting end to a spectacular and memorable trip! 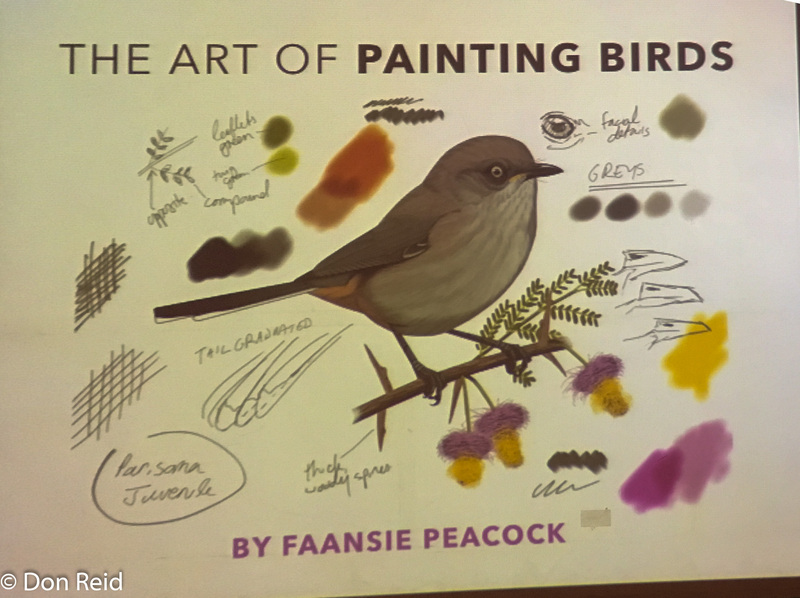 Thanks and Well done to Birdlife SA!